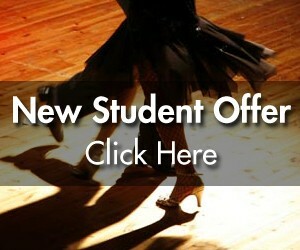 If you are interested in learning a specific dance and are not sure whether we teach it or not, please contact us. Learning the Rumba is a prerequisite for good Latin dancing. The Cuban Motion is essential in most Latin dances. The Rumba is used by good dancers everywhere and provides interesting variety suited to a limited space. Neat, attractive, precise footwork gives you confidence in your dancing. The Rumba will sharpen your sense of rhythm, timing, and muscular control. The Cha-Cha adds fun to your dancing through it’s syncopated steps and many open movements. When you can dance many interesting combinations with ease, you and your partner will be able to feel the pulsating latin rhythms which make this dance so fascinating. The energetic rhythm of the Cha-Cha encourages you to cut loose and let your personality show. The Swing is a spot dance with a carefree relaxed style and is a dance easily mastered by most people. The various speeds are excellent training for quick footwork and good leading & following which will add comfort and ease in other rhythm dances. After mastering the patterns, both men and women will find Swing a fun and exciting dance to learn and practice. Perhaps the most uniquely American of all dances, the Swing brings forth a buoyant carefree movement. It’s one of the dances that becomes contagious. Merengue develops Cuban Motion and the ability togue is the simplest dance to learn. It’s uncomplicated timing makes it easy to feel the music. adapt to any partner. It is the only Latin dance that combines one-step timing with Cuban Motion and therefore is a help to all Latin dances. The march type beat sharpens timing & coordination and the proper use of the accent will develop a clearer interpretation of musical rhythm. Jive Jive is an international competitive Swing dance with elements of the Lindy Hop and Jitterbug. Characterized by up-tempo single-time music danced with triple steps done primarily on the toes with very lively movement. Hustle originated in the 1970′s Disco Era and was popularized by John Travolta in the movie “Saturday Night Fever.” Both the music and the dance swept the country like wildfire, and although the white suits and gold chains have faded away, the dance has stayed, giving us the fusion of Swing and Disco. Hustle is still one of the most popular nightclub dances across the country today. Popular musical groups of today have revived interest in the musical styles from the original Lindy Hop Era and have fired the imagination and enthusiasm of a whole new generation of Lindy Hop dancers. However, the acrobatic style used for exhibitions is not the same as the quietly rhythmic Lindy enjoyed by most dancers on the ballroom floor. WCS is a stylized Swing dance popular west of the Mississippi from Kansas to California. Danced to slow or medium tempo Swing or Disco music and characterized by slot movements, taps and shuffles, coaster steps, and push and pull action of the dancers. Samba improves the flexibility of the body and helps achieve easy movement and lightness. The Samba rolling action teaches the body to be supple. To move lightly, quickly, and smoothly without effort takes study but only at the start. Although considered a good exercise, Samba should be danced smoothly and in a relaxed manner giving the appearance of effortless movement. Sometimes called the South American Waltz, the Samba pulsates to a unique Latin rhythm. Mambo is a fusion of Cuban and American dancing. The music is characterized by a stirring Afro-Cuban beat. Mambo is an exciting dance which allows you to develop your own feeling and expression. Because Mambo is such a fun dance, good Mambo dancers are always popular and in demand as partners. The wild exciting music, and rhythmical body movements make the earthy Mambo irresistible. Salsa is the Spanish word for “sauce” denoting a “spicy” and “hot” flavor to this popular dance style to a complex mix of many different rhythms. There are indications the term Salsa was coined by radio disc jockeys in Puerto Rico as early as the 1960′s. Later associated with a New York sound developed by Puerto Rican musicians, Salsa is considered the national music and dance of Puerto Rico. The fusion of an Afro-Cuban beat with enhanced jazz textures results in an aggressive high energy pulse which has become popular everywhere. Many of the patterns are closely related to those of the Mambo and Cha-Cha. Jitterbug is also known as single-time swing. It is usually done to faster Swing music and is a highly energetic and expressive dance. It could also be referred to as a toned down Lindy Hop. It is also a spot dance and highly useful on crowed dance floors. Originally a Spanish dance in ¾ time, it was changed in Cuba into 2/4 time and then eventually into 4/4 time. It is now present as a very slow type of Rumba rhythm. This dance is often said to have the rise and fall of Waltz, the contra-body motion of Tango, and the rhythm of Rumba. It is a favorite of dancers, as it incorporates many techniques similar to other dances to create a slow, sensual, romantic dance. Fox Trot is a basic dance from which you can acquire a foundation. Learning to combine dance steps easily and smoothly teaches variety and maneuverability. The Fox Trot posture is attractive in appearance and helpful to all other dances. Being able to dance to slow, medium, and fast tempos will add confidence to your dancing and will assure fun and relaxation for your partner. The Fox Trot provides a good foundation for all dances and is often called the “get-acquainted” or “first impression” dance. Waltz develops balance and control. The basic Waltz steps are the foundation patterns used in most ballroom dances. Correct posture, rise and fall, and flowing movements should be stressed to achieve good styling. The elegant sweeping movement of the Waltz gives dancers a chance to practice balance and to move lightly with ease. The Tango is one of the most beautiful of all the dances. It is characterized by earthy and dramatic movements. In order to achieve the distinctive style of Tango, it is important to develop controlled staccato footwork along with fluid graceful movements. The unique rhythm of the music is great training for timing and phrasing which develops as the dancer becomes more proficient. Tango practice is essential towards becoming a good dancer. With such wonderful composers as Johann Strauss and others, the Waltz became more and more refined. The steps became smaller with the turns smoother and more compact. Adding the graceful lilt of the flowing skirts we have today’s Viennese Waltz. The Two-Step originated in the 1800′s by people who arrived here from Europe. It was an offspring of the minuet and they danced it as QQSS. In the old Western days when women were not allowed to dance with men, men danced together and that is the reason for the hand on the shoulder holding a can of beer and the other hand to the side. The only women who eventually danced with these men were Indian Squaws and that is where all the turns came about, because Indian women loved to spin. Two-step is a Western dance whose popularity has spread all over the United States. This is the Country Western counterpart to the Ballroom Waltz. This version is generally faster and progresses rapidly down the floor. Generally seen as the romantic country dance, the movement is graceful and playful through its use of turns and spins. Country Swing is also referred to as 4 count Swing or Pony swing and is characterized by its use of continuous rock steps. This is an easy dance to learn and is often fun for those looking to get out on the dance floor immediately. A stylized Swing dance popular west of the Mississippi from Kansas to California. Danced in a slot to medium to slow Swing or Disco music and characterized by slot movements, taps and shuffles, coaster steps, and push and pull action of the dancers. The following are miscellaneous dances that are taught at Arthur Murray. If you are interested in learning a specific dance and are not sure whether we teach it or not, please feel free to contact us. This dance was introduced to society in 1844. Every now and then it is revived because of it’s boisterous charm. It is supposed to have been originally created by a Bohemian girl. The basic step consists of a preparatory hop followed by a chasse done first to the left and then to the right. Curiously enough, it reappeared again in the 1940′s in the Cha-Cha as one of the more popular steps. The Polka is still danced quite often throughout the country. This dance originated in the West Indies where it was danced only by the lowest classes. The name is from the African Tanganya. The dance found its way into Argentina where it was re-created by the Gauchos in Buenos Aires. It was actually an attempt on their part to imitate the dance except that they danced it in a closed ballroom position. The Tango caused a sensation and was soon to be seen the world over in a more subdued version. This dance is an easy playful dance that can be done to many pop songs. It is done to 4/4 time music and has similar patterns to those found in Salsa, although the style of this dance is much slower and smoother. This is a popular dance among wedding couples as it is usually a good tempo for the slower romantic ballads. Slow Dance This dance is related to Fox Trot but is done with even timing and on smaller crowded nightclub floors. This is a great dance for couples who want to get out on the dance floor immediately. It is useful in jazzy nightclubs or lounges.